While setting up the poll on the right I did something wrong and it was prematurely closed. This has now been corrected – you can again vote for your favourite. Last week I started solving weird ‘out of memory’ crash in one of our services. First reports of problems came in from a client but with some experimenting I managed to repeat it on the test configuration. The program works nicely for few hours and then something weird happens and it starts using the memory, few megs per minute, until it crashes. Repeating the problem on the test configuration usually means half the victory won but this time it wasn’t so :( I was fighting the most terrible of memory leaks – a live leak. Memory was allocated, stored away in some management structure and properly disposed off when the program terminated. FastMM have shown no problems at all. Such problems are always hard to find. Chris Rolliston has published his monumental[*] work “Delphi XE2 Foundations” in Kindle format (paper version to follow). The book is split in three parts (TOC is provided in the book home page), each priced at £7.99/€8.99/US$9.99 (which of course translates to $13.79 for people not living in USA, UK, DE, FR, ES or IT – damn Amazon!). As the book is excellent, the price is more than fair – if you doubt my words, download the sample from the Amazon. As the book site is called “delphifoundations.com” and not “delphixe2foundations.com” I can’t but assume that Chris will update the book to following Delphi releases, which would indeed be a great thing. [*] It is hard to tell book size from the Amazon’s download size but I have read Chapter 15 (Multithreading) in advance and I can attest to the fact that it is a) very long and detailed, b) very exhaustive and c) very well written. I have finally pushed the Publish button and “The Book” is now available on LeanPub. To get the current book status, click here or on the book cover image right to this post. If you want to affect the order in which the book is written, participate in poll on the right (below the book cover image). I will complete the “High-level Multithreading” chapter regardless of your votes but then I’ll follow the majority. A chapter on Parallel,ForEach is now available online. 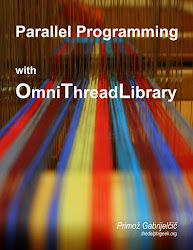 Parallel Programming with OmniThreadLibrary is now complete. It will be updated as the OmniThreadLibrary itself is updated, but other than that it is done. Go to LeanPub to learn more about the book, read the free sample or buy your own copy! It looks like I’m playing this game with Parallel.Join. I can’t make the @#$%^ thing to work correctly. That’s why I have just issued another hotfix. If you are following the SVN head, just do the Update. Otherwise, please download the updated OtlParallel unit. Thanks go to [meishier] for reporting the problem! I have decided to start up a new blog, dedicated to programming with Smart – www.smartprogrammer.org. If you are using the Smart Mobile Studio or if you think that programming mobile applications with Pascal is an interesting idea, make sure to bookmark it. I will however not move all my Smart-related posts there, most important stuff will also be published here. And the last but not least – I have created a Twitter account. (Took me a long time, I know.). Follow me @thedelphigeek and you’ll get notifications about the OmniThreadLibrary, A Smart Book and more. There was a nasty bug in Parallel.Join which (sometimes) raised its ugly head when number of tasks submitted to the Join abstraction was larger than the number of parallel execution units (threads). Big thanks go to [Passella] for reporting the problem together with a reproducible test case. If you are following the SVN head, just do the Update. Otherwise, please download the updated OtlParallel unit.